Today I’m partnering with Macy’s to shine a spotlight on one of my favorite brands for summer fashion, 1.STATE. If you are a TSSG reader then you are well aware of my love for classic styles with feminine details and 1.STATE does it better than most. Their brand is characterized by causal wardrobe staples, feminine silhouettes and versatile dresses that can easily be worn grabbing dinner, on vacation, to church or even in the office. Since I work at our family’s construction company and my other job is as a blogger, I don’t feature work-wear all that often. I do however get a ton of style questions from those of you who have office jobs. If you work in an office or just love easy staples that transition from the workday to the weekend then 1.STATE needs to be on your radar! Today’s outfit features a lightweight striped faux wrap dress that looks great with cognac accessories thanks to it’s muted grey coloring. A few other items I own from 1.STATE are this ruffle mini dress in green and this peasant top. As I’m writing this I just noticed a new tassel blouse that I love so go ahead an count that in my closet favorites. 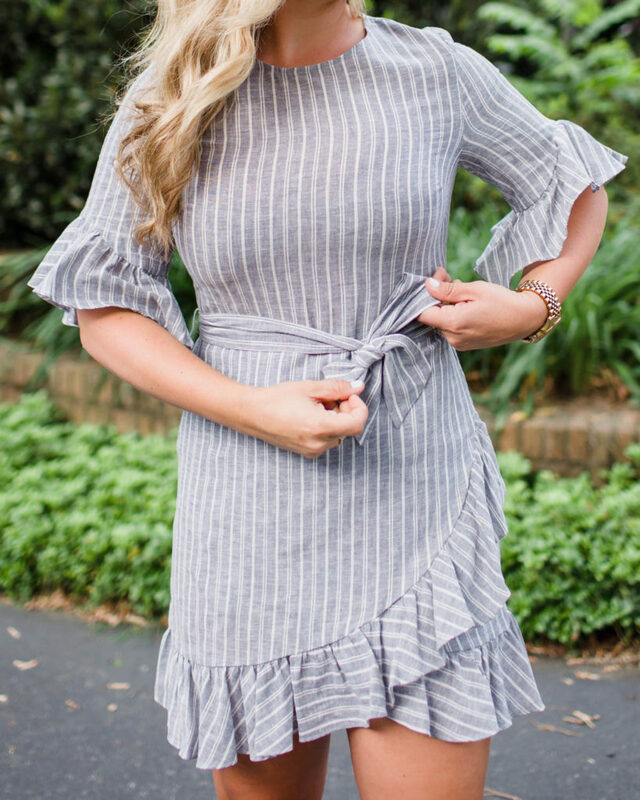 Other online standouts include this ruffle sleeve top red, white & peach, this ruffle one sleeve top, a feminine ruffle sleeve eyelet top and a casual keyhole top in black & white. Have a summer wedding to attend? I love this black midi dress. I also think this short sleeve twist-front dress would be perfect for work! And if you’re already planning your outfits for the 4th this tie front top is available in red or white and would look great with distressed denim shorts! Today’s outfit features a lightweight striped faux wrap dress that looks great with cognac accessories thanks to it’s muted grey coloring. A few other items I own from 1.STATE are this ruffle mini dress in green and this peasant top. As I’m writing this I just noticed a new tassel blouse that I love so go ahead an count that in my closet favorites. I paired today’s dress with my favorite low-profile espadrilles, tortoise shades & a straw bag perfect for summer. Here is a look at another 1.STATE item that is a part of my summer wardrobe. It’s lightweight and I love that there is room in the arms and the body without feeling like I’m wearing a parachute. I’m in a small for reference so I would say it runs true to size. I paired it with these skinny jeans and these incredibly comfy espadrilles but also think it would look equally as cute with a pair of distressed denim shorts and flats! I ordered this pair the other day and love them but you definitely need to size up! See more of this look here. This post was sponsored by Macy’s and ShopStyle. All opinions are my own. Photos by Katheryn Blythe.